These Big Backyard Playsets offer a such a wide variety of wooden outdoor play equipment for toddlers. 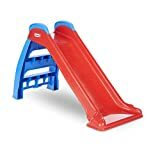 This huge Big Backyard playset is particularly appealing to me because it includes a spiral slide! It not only offers a wide range of toddlers outdoor play equipment but also contains so many features that encourage imaginative and creative play. Three swings and a mountain! The Meadowvale play center includes three swings. Two belt swings and a glider swing. Your youngster sits astride a glider swing and holds onto the guard rail. 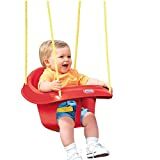 This glider swing is big enough for two kids to swing on together. When one goes up the other goes down. Like an aerial seesaw! Besides a climbing frame to the side of the swings there is also a wide cedar climbing wall leading up to the clubhouse. This has plastic hand and footholds. Your child can either use these to clamber on up to the play house or they can step up the cedar slats. Do you know any young monkeys? Extending over the swing area is a two foot wide, six foot long overhead monkey ladder.This big playset certainly offers a real heap of childrens playground equipment providing kids a good variety of challenges and forms of exercise. The centerpiece of this toddlers backyard playset is the elevated playhouse/clubhouse. This offers a 15 square foot play deck covered by a multi colored reversible awning. The clubhouse has a maximum standing height of nearly five feet. Besides a window, this attractive cedar playhouse contains a write-on/wipe-off chalkboard. Useful no doubt for recording who’s in and who’s out as well as for those artistic masterpieces inspired by the climbing and swinging experience. The area beneath the clubhouse is well designed. It has a large sandbox as well as a cafe table. A great place for rest and refreshment , whilst you’re waiting for your turn on the slide. And what a slide! This big green spiral slide allows nearly 12 feet of ride. Whee! There really is so much for kids to do in this backyard playset. This really is a big backyard childrens play ground measuring 18’6″ x 11′. So you would need an area of around 30 feet by 24 feet to accomodate this playset in your yard. We like the safety features incorporated into this playsetI. There’s a high rail on the slide and a sturdy wooden anchoring system for the whole of the playground. If you have the room, we think this toddlers backyard playset offers kids a tremendous variety of play experiences. There’s a good selection of toddlers outdoor wooden play equipment along with facilities for sandplay, chalking and sitting quietly. Prices are accurate as of April 25, 2019 5:21 pm. Product prices and available are subject to change. Any price and availablility information displayed on Amazon.com at the time of purchase will apply to the purchase of any products.